Stylus RMX in 'Easy' mode. 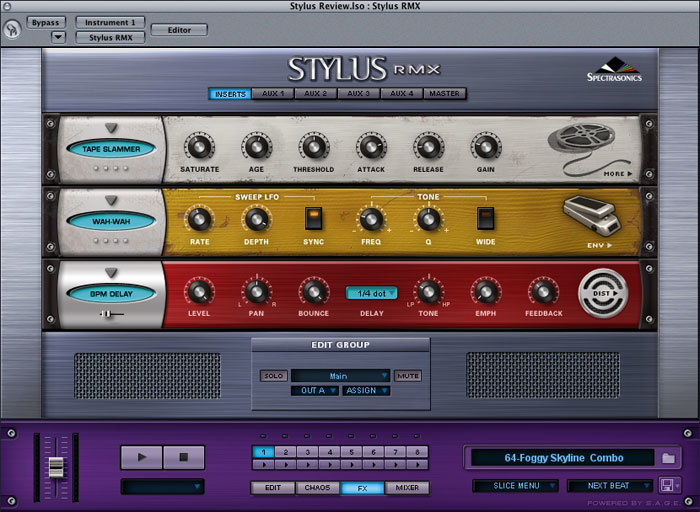 Ever since we saw Stylus RMX demonstrated for the first time, we've been itching to get our hands on it. Although Stylus RMX has the same purple livery (and retail price!) as the original Stylus, and includes all the original Stylus 'urban'-type beats, scratches and sounds within its greatly extended library, it is actually far more sophisticated than Stylus, and has a completely revamped underlying technology. It is still essentially a groove-based virtual instrument plug-in, mainly for creating rhythmic loops, but in this new incarnation, it combines the flexibility of the Spectrasonics Groove Control loop format with the company's new SAGE instrument front end (Spectrasonics Advanced Groove Engine). This combination has a lot of tricks up its electronic sleeve, including the ability to allow you to use any groove or combination of grooves at any tempo with some impressive pitch, processing and effects pyrotechnics thrown in. Stylus RMX is compatible with Macintosh OS X (Audio Units, RTAS, and VST) and Windows (VST) plug-in formats and existing Stylus owners can upgrade for what seems to me to be a very attractive price — $99. Installation is from two DVDs, and a third disk currently contains instructional videos in place of a paper manual. Amongst the sequencers supported are Apple Logic (including Logic v7) and Garage Band, MOTU Digital Performer, Digidesign Pro Tools, Ableton Live, Steinberg Cubase SX and Nuendo, V-Stack, Fruity Loops, and Sony Acid Pro plus Cakewalk Sonar and Project 5. According to the Spectrasonics web site, those customers who registered a new copy of Stylus for the first time after January 1st, 2004 will be upgraded free of charge (apart from shipping costs, that is). The original Stylus was based on Ultimate Sound Bank's UVI engine, but the new SAGE engine was designed in house at Spectrasonics and so is rather better adapted to Stylus 's needs. The need to manually import Groove Control MIDI files separately to the audio loops has been eradicated, and like Apple Loops and similar systems, loops may now be directly auditioned from within a file browser at the tempo of the host sequencer. There's also the option to play loops at half or double speed relative to the host sequencer. The Groove Menu mode pioneered in Stylus to provide a different loop or element across multiple keyboard notes is still available, but now the loops sync to the host tempo in this mode rather than being preset. This is particularly welcome, as previously you could use either Groove Control or Groove Menus, but not both together without opening multiple instances of Stylus and combining the elements that way. Not only has the core library more than doubled in size since the original Stylus, it is also now possible to import other Groove Control material (currently in Akai or Roland GC formats) as well as REX-format samples to extend the capability of the instrument, which addresses one of the limitations of the original Stylus, its non-expandability. In addition, earlier Spectrasonics Groove Control titles are being reformatted as SAGE Xpanders for Stylus RMX. Lots of new tools have been provided to allow the user to layer, process or randomise the loops in a very musical and intuitive way, and up to eight physical stereo outputs are supported with up to eight parts of multitimbrality. A new multi-mode Power Filter has been added along with three sync'able LFOs, three AHDR envelopes, the ability to reverse sounds and a slider to control the sample start time, so it's very easy to make the loops sound very different from those of other Stylus RMX users. However, if this all seems a bit scary for the new user, there's also an Easy Edit page option (shown above) that presents just the most important controls as a small number of sliders and knobs. This means you can use Stylus RMX on a number of levels, from preset beat machine to full-on groove design tool. 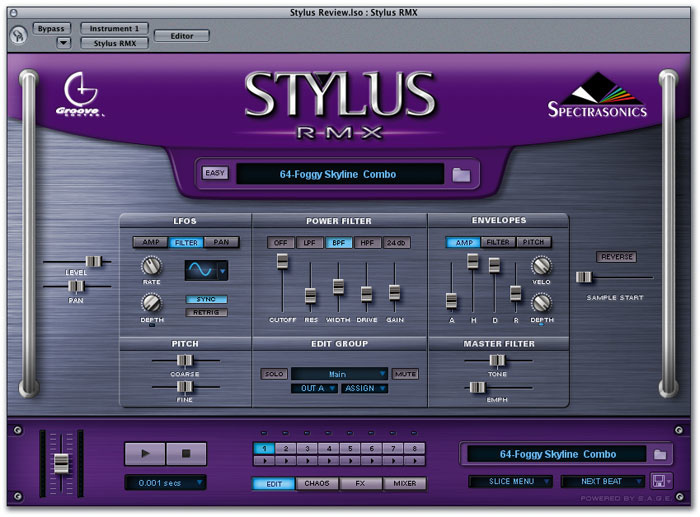 Stylus RMX also includes its own mixer page and effects rack with inserts and aux sends to allow layered loops to be balanced and treated to perfection. Even this offers more than it first appears to, as the Edit Groups feature allows changes to be applied to individual beats, not just to individual loops. The library of single drum hits and effects has also been greatly expanded, and you can also call up or create drum kits of up to eight sets of single hits that conform to GM mapping conventions. This section in itself is pretty vast. Buttons on the mixer page switch between Multi and Kit modes and in Kit mode, you can assemble your own kit from the single-hit menus, set the balance, pan and effect of each sound, then save the end result as a playable kit. This doesn't limit you to just eight voices though, as loading a tom set into one part includes all the different toms in the kit. By default, Aux 1 sends to the reverb plug-in, but you can change this if you like. Rather than a paper manual, Spectrasonics currently provide a series of short Quicktime video demo sessions to explain all of these new features, although apparently there is talk of also producing some kind of Quick Start manual in the future. For now, though, I must say that the videos work really well, taking you through all key aspects of the program in a very effective and easy-to-follow way. It is worth recapping the basics of the Groove Control format for the benefit of anyone who hasn't come across it before. There are various ways of changing the pitch or tempo of a drum loop, either together or independently, but typical time-stretching algorithms only work over a limited range before the sound quality is compromised. Groove Control is conceptually similar to the REX file format written by Propellerhead's Recycle in that the recorded drum patterns are cut into beat-sized slices and then triggered at different rates by a MIDI file running at the desired tempo, but whereas anyone can make REX files using Recycle software, Groove Control is only available in Spectrasonics libraries. In Groove Control loops, though, the individual slices are treated and extended in such a way that even when the tempo is slowed right down, you don't hear unnatural gaps appearing between the sliced-up beats of the original waveform. Similarly, when a tempo is increased, the release time of the beat segments is automatically shortened to prevent the sounds from smearing into one another. The end result is that loops can be varied in tempo over a wide range without sounding unnatural, and it's also possible to change the pitch of some or all the sounds in a loop without disrupting the rhythmical flow. Just like REX files, Groove Control loops are triggered from a chromatic 'ramp' of MIDI notes, so you can edit the MIDI data to change the order in which the slices play back if you wish. In previous Groove Control libraries, you had to find the controlling MIDI file that matched the loop, and then import it into your host sequencer for editing, but in Stylus RMX, loops can be auditioned from within a browser, then the selected loop name can be dragged directly into any sequencer that supports drag-and-drop MIDI file import. The outcome is the same as before, but this time the program does the work of finding the right MIDI file for you. If your sequencer doesn't support drag and drop (like Pro Tools), you can drag the loop name to the desktop to create a copy of the MIDI file, which can then be imported conventionally. You can also play loops directly from within Stylus RMX and then record them as audio if you prefer, if your host sequencer allows audio to be recorded from plug-ins. User-defined sets of grooves, kits and eight-part multis can be saved separately (multis include all effects, mixer and Chaos settings). Finally, REX files may now be imported, so there is a way to get your own beat-sliced material into Stylus RMX at last. The original Stylus came with around 3GB of sounds based on drum loops that were recorded to vinyl prior to mastering. The new library contains all the old sounds and maintains the same flavour of rhythmic material, but it has now been extended to 7.4GB and comprises literally thousands of grooves, hits and effects. The grooves also now cover a somewhat wider range of modern musical genres and include some impressive processed sounds. As with the original Stylus, the grooves are broken down into individual parts known as Elements, allowing them to be layered in different combinations. There are also new Kit modules and user Kit construction facilities — it's here that you get to build your own kits from around 10,000 single hit samples arranged by category. Furthermore, there's a great selection of single instrument loops based on percussion such as bongos, congas, shakers, tambourines, drums, cymbals and triangles that can add the feel of real players to self-constructed drum parts. The Browser, showing just a few of the many, many built-in sounds and loops. Loops that simply repeat soon get boring, but with Stylus RMX there are various ways to add variety. The plug-in Window actually has four main sub-windows activated by dedicated buttons that focus on different areas, but the lower part of the window is always the same and shows the eight parts along with their playback status and play/stop buttons. The top window always reflects the settings of whichever part is selected in the lower section of the window, so it's easy to jump between parts. Global controls similar to those available in the original Stylus allow high- or low-pass filtering to be applied to the entire part, and these can of course be automated where the host sequencer allows. And of course, there's also the much-trumpeted Chaos Designer (see the box opposite for more on this). The Edit Window's Easy option simply hides some of the deeper features, but even the full version is pretty easy to understand. However, what may not immediately be obvious is that the settings can be applied to Edit Groups (where you can choose which beats in a measure to process), so you can really change the sound of a loop very radically at beat level. Three sync'able, multi-waveform LFOs (with an optional retrigger function to ensure the waveforms trigger afresh with every slice) can control pan, level and filter settings and there are also master level and pan controls for adjusting those parameters in the currently selected Edit Group. There's also a multi-mode resonant filter with drive, envelopes for level, pitch and filter modulation, plus the master filter and pitch controls familiar to existing Stylus users. Edit Group sounds can be reversed and it's also possible to offset the sample-playback start point, which can yield some very interesting results, especially when used in combination with reverse. This page offers a lot of potential for sound manipulation — the envelope- and LFO-driven filter can easily generate all kinds of familiar techno sounds from the most innocuous of source material. One way to really stretch what Stylus RMX has to offer is to use the Edit Groups to make changes only to certain slices. You use the Assign button to add Edit Groups to your list, so at a simple level, you might just decide to pick downbeats and backbeats, applying perhaps a filtering effect to one and a pitch-shifter to the other. In fact, you can create as many different Edit Groups as you like (up to eight can be active at any time) and pretty much every Stylus RMX parameter can be changed per Edit Group, including the effects and mixer settings, the way Chaos is applied, and of course all the Edit Window settings. Solo and Mute buttons let you hide or solo the currently selected Edit Group, so using these functions you could even mute the kick drum from a loop and then layer it with another kick-only loop to create a hybrid. A little experimentation can quickly produce great results, and if you've a mind to, you can bend and mangle the loops beyond all recognition. The splendidly oxymoronic Chaos Designer. While it might seem that Chaos Designer is a contradictory term, what with chaos being a random thing that is not subject to the laws of design, in Stylus RMX, it is possible to apply something called Chaos to your audio, control the amount being added, and decide where to apply it. In this case, some rather clever programming allows random elements to creep into the timing, timbre and voicing of a loop using just a few simple sliders and knobs. Chaos can even reverse individual slices. The programming of this feature is so clever that if used in moderation, the program can give the impression that it's actually improvising in a musically sensitive way — something many drummers I've worked with have yet to achieve! The key to imitating musical intelligence is in the Edit Groups (hidden under that middle grille) that allow the user to select which beats within a measure will be affected and which will be left alone. For example, you could choose to add chaos, filtering or a pitch shift just to the off-beats or on-beats within a measure — a whole list of beat permutations is available. As the grooves play through Chaos Designer, the timing data that controls the audio slices is modified and a section of playback may be saved using the Capture feature. The resulting MIDI file may then be dragged and dropped into your host sequencer where you can modify it further or simply take the best bits. Of course you can also let chaos reign in real time, but that precludes any 'cherry picking' after the event. When you first open an instance of Stylus RMX, you see a 'flash screen' that disappears to reveal the Edit window when you click on it. The current patch name is shown in a display at the top of the window and clicking this or the folder icon next to it takes you straight to the loop browser, where you can then select from RMX Grooves, Classic Stylus, Groove Elements, Sound Menus or Example Groove Menus. There's also a utility section containing some useful oscillator tones and a click track. Each of the RMX Groove Directories (and there are 174 to choose from) contains from one to a dozen or so elements that can be used as variations or for layering. Clicking on any element causes it to play back at the song tempo, and clicking on it again, or clicking on the Stop transport button, halts playback. Any elements you really like can be added directly to your Favourites library using the Add button while Jump takes you directly to the Favourites section. I'd half expected this button to toggle between the Favourites and the bank you just left, but it seems not to do this. The Classic Stylus Groove Directory is arranged in a similar way with 170 themed grooves plus 10 single-instrument percussion grooves. Stylus RMX has a new 'Next Beat' feature for working with Grooves. When enabled, this starts the groove playing at the start of the next 16th or whole beat, depending on which option you select. This makes live performance possible, as it's almost impossible to get the loops playing out of sync unless your timing is a whole beat off — all you need to do is anticipate the start slightly and Stylus RMX will ensure the groove starts on time. There are two main ways of working with loops — you can either drag the MIDI 'slice' files into a sequencer track or you can trigger a loop element from a single key. Unlike the original Stylus, this latter way of working lets you change the tempo so the loops are being sequenced as slices, but this time from within the SAGE engine. With the old Stylus, you couldn't work with a keyboard full of loop elements at the same time as having tempo flexibility, but now you can. Where the host sequencer supports it, Stylus RMX can also be operated as a multitimbral instrument where each part is controlled via a separate MIDI channel (1 to 8). Loading and saving is available both for single parts and also for multis. It's important to understand the Slice Menu MIDI mode and Groove Menu MIDI mode, which can be selected using a button at the bottom right of the panel. Groove Menu mode is the one to use when you wish to work with groove elements triggered from individual keyboard notes. The topmost element in each group is assigned to middle 'C' and the groove volume is sensitive to note velocity. MIDI notes should normally extend the full length of the measure, and without overlapping the next note, but you can trigger just the first quarter of the loop repeatedly by playing, for example, four short beats per measure rather than one long one, which would allow you to turn a rhythmic loop in a different time signature into a four-on-the-floor rhythm. The sequencer track name includes the term Menu if Groove Menu mode was used to create it, as it is important to play back in the same mode you used for recording. If you tried to play back a Groove Menu loop in slice mode, you'd only hear the first beat of each pattern being played back, because the plug-in then expects to see one MIDI note per slice, not one note per measure. While Groove Menu mode allows you to play back more than one element at a time, Slice Menu mode only allows you to work with one groove element at a time unless you use the plug-in multitimbrally. The advantage of working in this mode is that you can manually change the MIDI data to alter the way the slices play back and you can also use the Chaos function, which actually changes the MIDI slice data if you decide to capture the playback using Capture mode. By contrast, when using Edit Groups for a Groove Menu, you can still have Chaos on individual Grooves/keys, but it will be different every time it plays back, and is not repeatable. One useful tip revealed on the tutorial video is to use Slice Menu mode when auditioning elements as only the currently selected element is loaded for playback, which speeds up loading time. By contrast, using Groove Menu mode loads all the elements in a set, which of course takes a little more time. Auditioning works and sounds the same way in either mode. Here's where you really get your hands dirty — the Edit page. Existing Stylus users should have no problem with these concepts, but the mixer section is completely new. Here you can mix and effect either the layers in a multitimbral setup or the individual elements in a drum kit, depending on the mode used. You can also route parts to different audio outputs where your host sequencer permits. When balancing a multitimbral mix in Multi mode, operation is just like a conventional mixer, with the ability to add effects on the inserts, the four sends and the final mix. Complete multis may be named and saved for straightforward recall. Clicking the Effect button shows the insert effects in the form of a virtual effects rack and clicking on the little triangle brings up the effects menu. Clicking on the Aux 1-4 or Master buttons at the top of the screen shows the effects for those as well. Clicking the Kit button at the top of the screen changes the mixer to Kit mode where each mixer operates on the same MIDI channel and a channel now controls one group of drum sounds, which can be selected using the patch name window or browser folder icon — either gets you to the relevant libraries. You just won't believe how many different drum hits are waiting for you in there — even the categories are divided into categories! Each sound category has its own MIDI assignment so when you assemble your kit, you won't find sounds fighting for the same MIDI note unless you use, say, two sets of kick drums or two sets of toms. The mapping pretty much follows the General MIDI standard, and where you have, say, two snares on the 'D' and 'E' keys, there are two chevrons next to the sample name rather than one. Separate effects can be added to individual drum sounds and the master filters and tunings can be applied to each sound group individually via the Edit page. Individual parts can be saved along with their effects and Edit settings or complete kits may be saved. Because the kits are compiled mainly from sections rather than individual hits, when you switch to a different hi-hat, all the correct hi-hat sounds load together (open, closed, struck and so on) so you don't have to do all the hard work yourself. When you combine all this with the ability to apply pitch, filtering, modulation, panning, level and effect changes to individual Edit Groups, the results you can achieve are about as close to infinite as it gets in a finite universe. Using all this power takes some getting used to, but the great thing about Stylus RMX is that you can start out simply and then just experiment — the only real trouble you can get into is overloading your CPU by applying too many effects. Finally, I should mention that the current version of Stylus RMX passes the Audio Units validation in Logic v7 without problems, but updates are already posted on the Spectrasonics web site which fix a couple of minor niggles, so it's worth pulling these down at the same time as you visit their site to authorise your copy. The SAGE import application used to import existing Groove Control libraries has also been updated, so it's worth grabbing that too while you're there. 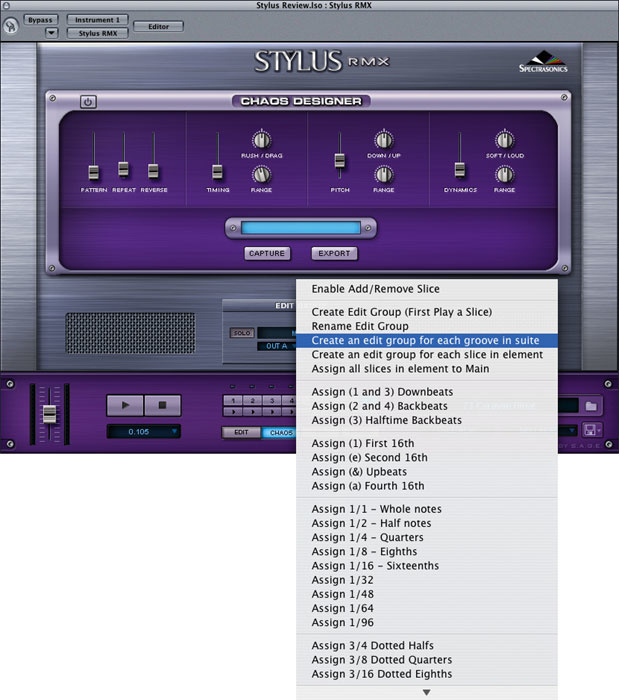 Although Stylus RMX can feed up to eight separate stereo outputs, its mixer page enables each of up to eight parts to be effected and panned separately as well as being controlled in level, so even if you are only using it in stereo, you still retain full control over all the elements. The mixer is fairly conventional except that it runs horizontally rather than vertically, and features both insert points and four aux sends as well as level and pan controls. Just some of the built-in effects accessible from the FX window. The effects themselves are accessed via the Effects page, where a pull-down menu reveals a total of 24 effects including a valve limiter emulation, modern and vintage compressors, a wah-wah, the multi-mode Power Filter mentioned elsewhere, six different vintage, parametric and graphic EQs, distortion, a reverb, a gate/expander, a flanger, two types of phaser, three types of tempo-sync'able delays and the Retroplex tape delay. These effects are of surprisingly high quality and they are also reasonably processor efficient, but it pays not to get too carried away with them for processing individual parts, as you could end up deploying dozens at a time! At a simple level, you can apply the effects conventionally, but as mentioned elsewhere in this review, you can also apply effects only to certain Edit Groups, enabling you to, for example, add reverb only to the downbeats in a loop and distortion to the backbeats. Because you can get so carried away in designing sounds using Edit Groups, it can save a lot of CPU power if you use the Edit Group aux sends rather than inserts to add things like reverb or delay. You can still have different mixer settings per Edit Group, which means you can still apply different amounts of effect to different slices, but without opening multiple effects to do so. Naturally parameters may be automated, but because of the sheer number of parameters that it is possible to access (around 10,000 in all), you'll need to prioritise based on what your sequencer can actually support. This is made simple using a built-in MIDI Learn function that works by selecting the desired Stylus RMX parameter and then moving the hardware control that you'd like to assign to it. You can assign multiple controls to a single MIDI controller to create more complex changes, and there's also an un-learn option to cancel a previously made assignment. Stylus RMX isn't simply a Stylus update, any more than the Stealth bomber is a byplane upgrade, but it builds on the same Stylus Groove Control principles and, thanks to the instructional videos, is quite easy to get into. Even so, I keep discovering new things all the time. I've tried to explore most of the important aspects of the plug-in, but any attempt to be fully comprehensive is doomed to failure, simply because there is so much in there. The core library sounds are excellent and varied, the drumkit construction facility is vast and the ability to surgically change loops at beat level in so many ways is fantastic. Having this degree of control over the source material means that there's no excuse for anyone's work to sound stale or similar to anyone else's. The Chaos feature allows the loops to 'improvise' to head off boredom, and the effects section is so good that it's a shame it isn't available as a separate Stylus FX plug-in. If there is a criticism of Stylus RMX, it is that most of the grooves have the same type of feel (what you might call 'urban' styles, with a hip-hop, techno or industrial feel) and some users would prefer more straight dance rhythms or conventional drum patterns using acoustic drum sounds. However, this limitation is largely circumvented by the ability to import other Groove Control and REX-format libraries. Furthermore, the core library sounds can also be changed substantially, either by modifying the controlling MIDI slice pattern in your sequencer or by triggering grooves in half or quarter measures. 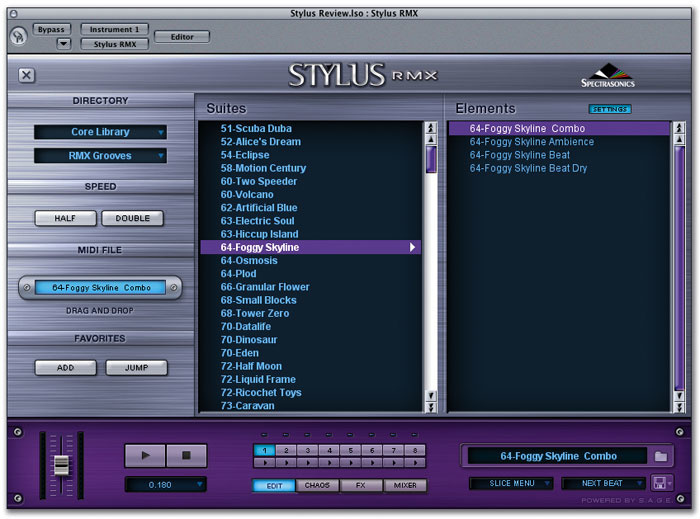 Anyone who already has Stylus really needs to check out Stylus RMX, but it is important to keep a copy of the original Stylus installed on your machine, as Stylus RMX is recognised as a new plug-in that's different to Stylus, and so won't open Stylus parts from old songs. In most cases, you can make a note of the Stylus patches used and recreate them using Stylus RMX, but you can't open old Stylus parts directly in the new program. Stylus RMX is a significant development in groove creation and manipulation, and the way in which it handles tempo and pitch manipulation along with the ability to individually effect, tune and process every single beat in a measure is really impressive. The fact that you can also create a massive range of excellent drum and percussion kits is almost incidental by comparison, yet Stylus RMX goes much further in this respect than many competing sound libraries or software instruments that attempt to do nothing else. Stylus RMX is a terrific bargain given how much it does and how little it costs, and I'm sure we'll be hearing it on a lot of records in the near future, but unless the programmers are very lazy, the really great thing is that we probably won't know it's Stylus RMX that we're hearing! Fantastic groove and kit library. Real-time operation over extremely wide tempo range. Ability to customise loops by changing or effecting individual beats. Clear instructional videos instead of manual. Effects section can't be used as a stand-alone plug-in. Old Stylus song parts aren't opened by Stylus RMX. 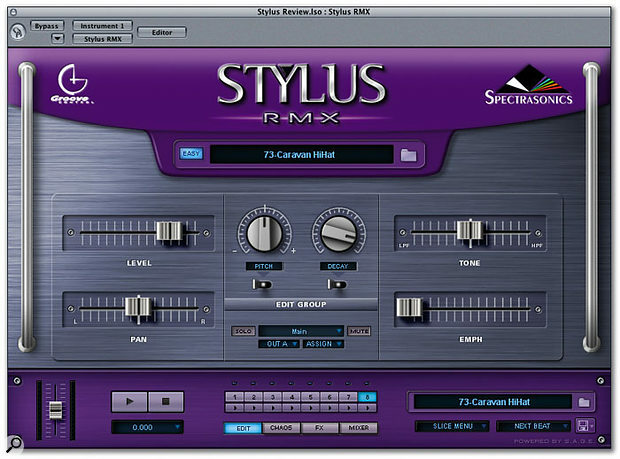 Stylus RMX combines huge pitch, tempo and processing flexibility with world-class source material and a surprisingly straightforward user interface. Stylus RMX, £159; upgrade from Stylus, $99 from Spectrasonics' web site. Time & Space Distribution +44 (0)1837 55200.